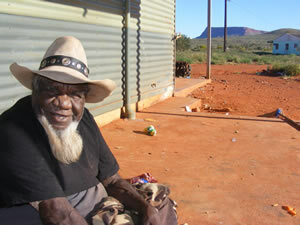 This week Western Desert Nganampa Walytja Palyantjaku Tjutaku Aboriginal Corporation (AKA The Purple House) celebrates an important milestone. We have been providing high quality dialysis services in Alice and Kintore continuously for 10 years. WDNWPT began after Papunya Tula artists raised in excess of one million dollars at an auction of paintings at the Art Gallery of NSW in 2000. Since that date we have grown into a strong community controlled health service at the forefront of holistic models of care for people with end stage renal failure. Since September 2004 we have had machines and nurses in Kintore 550kms west of Alice and at our ‘Purple House’ in Alice Springs. ‘There was lots of skepticism when we started’ comments Sarah Brown, CEO. ‘Would we be able to do dialysis out in the desert? Would we be able to recruit nurses to live out bush? Could we make it safe and sustainable?’ I think ten years show that we can and that the advantages to individuals, families and communities of people being back on country are huge! We now have 16 dialysis machines in 8 locations, an array of national awards and plans to launch a trust account next year to further our work across remote Australia’. Community controlled dialysis means a big emphasis on cultural priorities, on Indigenous training and employment and looking after each other. It is a story of people creatively tackling a difficult problem themselves and being optimistic about the future’. ‘We would like to thank all the people from around Australia and the world who have heard our story and helped us out over the years’ said Marlene Spencer, chairperson of WDNWPT from her home in Kintore. ‘We are proud of what we have done. We have worked really hard for our people and we have helped other communities like Hermannsburg, Yuendumu, Lajamanu, and Warburton to get dialysis. We know how important it is for families to be together and old people to look after country and teach their grandchildren’. There will be a morning tea at the Purple House, 69 Flynn Drive, Alice Springs on MONDAY 22 September 2014 from 1030am and a BBQ and ceremony in Kintore at the Purple House at 11am on Thursday 25th September 2014. WDNWPT gratefully acknowledges the support of the NT Department of Health, the Commonwealth and WA governments, Papunya Tula Artists, Woden Rotary, Central Land Council, Medicines Australia, Abbvie, the Freedman Foundation, Kurra, ABA, GMAAAC, Fresenius Medical Care, Caritas, Ngaanyatjarra Health Services, Walukurlangu Arts, Lajamanu Progress Association, EY, Waltja Tjutangku Palyapayi, the Business Council of Australia, Australian Unity and the many kind individuals who have helped us. We look forward to working with you all over the next ten years to give our communities a better, healthier future!